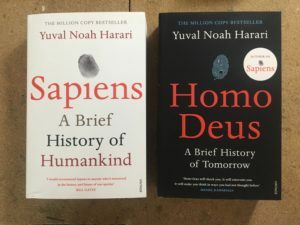 INSIGHT INTO OURSELVES: REVIEW OF BEST SELLING BOOKS “SAPIENS” AND “HOMO DEUS” BY HARARI. I’m late to the party on reading these; I avoided the hype and constant recommendations about them when they were released in the UK last year. They are also slightly different to what I would normally review (they are quite unlike anything else I have read, almost genre defying) but their nature, and what can be gleaned from them, makes them worthy of sharing. At the moment I am very much enjoing exploring us (humankind) from an outside-in perspective. We are absolutely fascinating, if at times a little worrying. There is a theory related to this called “Pleadian” – a belief that a species of alien, so concerned about planet earth and its inhabitants, and their future, they have contacted certain humans to be analytical about it. This was recently explained to me by a friend after I had regaled him with with the synopsis of these books. It’s a theory I don’t quite believe, (it is exceptionally far fetched and sounds like an episide of Charlie Brooker’s “Black Mirror” waiting to happen) however it’s a nice concept to hang a perspective on. There is a lot of work that speaks about our species and our history as humans, how our brains are wired and how we have created our lives, from a very level viewpoint, inside looking out. What is truly remarkable about Harari’s work is the removed sense of examination he gives us as a species. There is an almost evidential, regimented analysis that puts things very plainly in bitesize digestable, logical chunks. He also manages to discuss meta topics that may be able hard to pin down such as things like money, legends, religion, and technology in a very concise and matter of fact manner. To relate this to a better image: many people have their head under the water and consumed in their own little bubble; Harari is on a boat, above the water’s surface, watching all this happen. The blurb and concept of these books make them sound quite clinical, however the tone is far from this. It’s remarkably easy to understand, accessible, and has lots of fascinating tangents and interesting asides that provide comprehensible examples. In this perusal of humankind, Harari also manages to discuss concepts such as consciousness and how our brain and mentality has evolved over the years. It is hugely relatable and seems very close to home, if not somewhat eye opening with the evidence presented with it. Not to spoil the ending, (“Homo Deus” seems to pick up very naturally where “Sapiens” finishes, and I’d recommend reading both. They feel like a much larger tome or thought process that has had to be divided to allow them to be printed…) but they finish in a slightly bleak outlook looking towards the future and our place within it. I took some comfort and inspiration in this gloom though. Recently I’d read a few articles about creativity and the human brain being important capital in a world where more and more things are becoming automated. Machines can never imagine or dream, or connect to a human brain the way two humans may connect and interact. That is one thing that is safe guarded from being replaced and will always keep us human; it shows the uniqueness and wonder of the squishy mass of cells inside our skulls that we sometimes take for granted. It also shows why art of any kind has such a huge and important part within society as it allows for those sorts of connections, reflections and engagement to happen. As artists, who deal with creativity as currency to spark and instigate this kind of activity, it proves we are of value and the work we do is worthwhile doing even though at times it is under recognised and overlooked. A worthy read for anyone; I would recommend these to those who have a natural curiosity about us and the world around us. They feel like an anthropologist’s dream. Artists or creative practitioners of any form though may enjoy reading them though in being able to gain some insight for collective consciousness of today, and thinking about making work for the human of tomorrow – or at least questioning why we are heading in that direction, or how we got here in the first place….